New Sherwood bakery/cafe business plan calls for bite-size sweets, big growth. 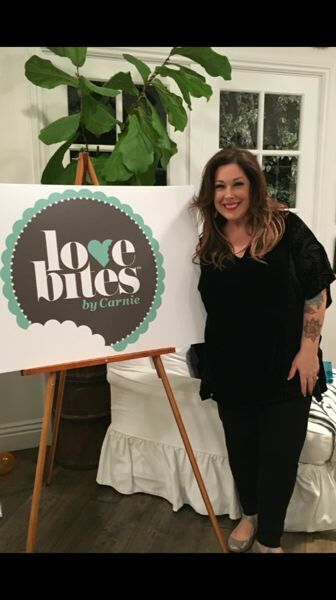 Love Bites by Carnie, a production bakery/cafe in Sherwood that makes bite-size desserts, hosted a grand opening of its 14,000-square-foot space at 15028 Century Drive in Sherwood last month. Carnie Wilson, daughter of Brian Wilson of Beach Boys fame, is co-owner of the shop. The grand opening included a performance by the '90s pop trio Wilson Phillips — made up of Wilson, her sister Wendy Wilson and Chyna Phillips. While Wilson and business partner Tiffany Miller initially planned to locate their business in Lake Oswego, the deal fell through for a variety of reasons, something Wilson said was to "our advantage and our blessing." "The plans are big and we needed a bigger space," says Wilson, who has been friends with Miller for 42 years. "We're very excited to be in Sherwood." Wilson says she's pleased to bring employment and energy to the city, pointing out that she's fallen in love with Oregon over the years and, more recently, with Sherwood. "Aesthetically it's gorgeous," she says. "I mean, I live in L.A. but I come out to Sherwood and I'm like 'Oh, my god!' I'm trying to convince my husband and my kids, 'Let's go, let's move here.'" While always interested in baking and cooking — often sharing a kitchen with her late grandmother — Wilson says it was when she was pregnant and in a nesting mode that she reached a pivotal time in her life, a time where she thought more about taking care of herself and an urge to settle down with her family. It was then that she revisited her passion for baking. "I just went straight to cheesecakes and bread puddings," she says. But it was a voice she heard after her grandmother died that urged her to pursue her pastry and baking dreams. "I literally was stirring a cheesecake batter and I heard her voice tell me a specific message about my future and my fortune. Very strange," Wilson says. "But I didn't look at it as my fortune like money, it was almost like fortune ... like being fortunate. I can't explain." But the message was specific — that her future would involve the cheesecake and other baked goods she had been bringing to family and friends over the years, which always received rave reviews. "I thought, 'This is it. It has to be a business,'" she says. A second epiphany would come while shopping and spying little heart-shaped cake/candy molds and thinking how cute it would be to make baby cheesecakes with them. And not only will Wilson produce her famed bite-size cheesecakes at the new facility, but pound cakes, brownies, crumb cakes, cookies (and eventually bread puddings) as well. The duo have bigger future plans in mind than simply the Sherwood operation. "We're going to open 600 stores nationwide," Miller says. "We're going to keep it close to home for now until we nail it, and once we nail it, we'll start the growth process."